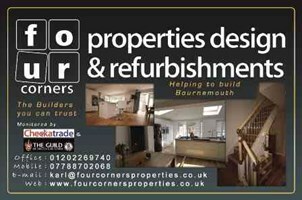 Four Corners Properties Ltd - Bathrooms, Builder, Carpenter, Driveways/Patios/Paths, Kitchens, Roofer, Rubbish/Waste/Clearance based in Ferndown, Dorset. Four Corners Properties Ltd are a local building company in Bournemouth that offer all building services to all local businesses and residents in the South Coast of England. We provide all aspects of the building trade and take on all major & small projects that you have in mind. We cover all aspects of house clearances, garage clearances & garden clearances. Check out our websites below for all services. We offer the service of full Architect Drawings to full Planning Permission Applications. We, as a company, also offer to Project Manage your job you have in mind or just work with our trade to make sure you get a quality job done. We are also offering special discount rates to all customers wanting to get work completed on a tight budget with a detailed cost plan of all work to be carried out. All our work comes from our tradesmen. We take great care to give you the attention to detail that you ask for. Please view our websites & feel free to contact us with any questions or queries you may have.